If the Anno series is old-hat for you, then perhaps this review isn’t going to bring out the content you’re looking for. I end up playing games that take less time – not because world-building and RTS games don’t interest me, but they can be massive time sinks with steep learning curves and obtuse rock-paper-scissor combat mechanics. I took a swing at the latest Anno, specifically Anno 2205 with its streamlined gameplay and single player focus. Without getting bogged down in explaining the details to all the components of the game, I’d like to give you a high-level view of what to expect – and whether they managed to make a compelling game worth your precious time. 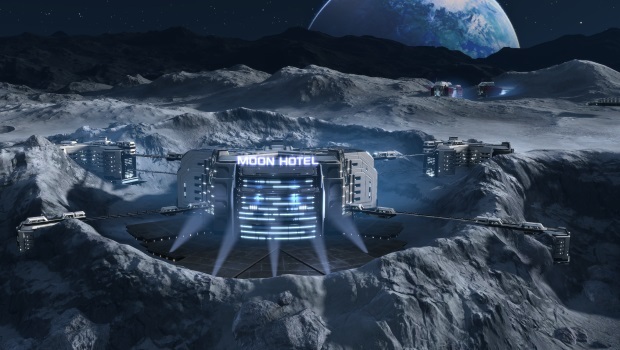 Anno 2205 takes place more than a century after the last game (2070), where there was a race to the moon. Colonized and then abandoned by Earth, the inhabitants are now up in arms as Earth’s markets focus on reclaiming the colonies on the moon as our resources dwindle. You begin the game as an upstart company with the lowest credentials, and aim to work your way up (literally) in the world. The game is played in five phases over a possible nine areas, three for each kind of terrain. The first is your typical climate that supports both warm weather and an abundance of trees. There are power restrictions, but generally there aren’t many barriers to how you want to lay out your buildings and this is by far the deepest tech tree and the largest growth area. The second climate is an artificially protected arctic, as global warming has destroyed the planet’s ability to keep the poles sub-freezing. You are tasked with keeping your development heat restricted, and so your layout changes to put residences beside factories to absorb their heat. The lunar region is similar in that you won’t experience quite as much sprawl. The risk isn’t heat but asteroids – and it costs you to maintain protective shields. The game is entirely single player, focusing on the user experience and having full control of your regions. When you’re at the overworld view, your other regions keep working. The world doesn’t stop, but thankfully Anno 2205 isn’t a hard micromanagement mistress. Power, transportation and building layout are all forgiving, allowing you to move after the fact (and reclaiming resources appropriately). Most structures have add-ons to help improve efficiencies and are all fairly straightforward. I found Anno 2205 to very approachable and with the separation of mostly-elective combat missions it is a beauty to behold. You don’t have gun turrets or primitive concrete walls breaking up the hustle and bustle of big business, nor do you have to run sewer pipes or manage point-in-time budgets. I am not a SimCity devout nor do I pore over the nuances of tech trees, yet there is some real substance behind the statistics and the game balancing behind the scene. Instead, Anno 2205 asks you to set up trade routes, balance value per unit sold, and even provides ticker numbers for stock prices, all without the normally attached boredom or frustration. In the red? Trade materials with another region, even competing companies. It’s not all perfect mind you. While the the world is lush and gorgeous, at times the overlay seemed to not cooperate where you would have an item stuck, or be selecting an area behind the UI button you’re trying to press – hitting the escape key generally clears this up. Sound effects and voice-overs are well done and surprisingly deep. The naval combat portions are complete and serviceable, however the cost to upgrade is prohibitive and AI is lackluster. A perfect example would be where your reinforcement ships remain in one spot. To get them to engage the enemy you sometimes need to draw the enemies back to them – but then again if the enemies stray too far from where they were sitting, they’ll get bored and leave. There are also a lot of “monster closets” – where enemies are content to sit and wait in ambush for you. Given that the RTS combat is both playable and mostly avoidable, it is easily overlooked. Anno 2205 is best be described as a gateway drug for city builders. There is enough here for those looking for a challenge, but is surprisingly approachable for newcomers. The content is futuristic in nature which allows a creative side – you’re not building fire halls, laying sewers and running power lines. If you are at all on the fence on finding a game which can deliver a rich experience and dozens of hours of gameplay with a great mix of resource management, city building, and RTS combat: this just might fit the bill.